The longer I write about food and restaurants, the less likely I am to pass judgments about their culinary authenticity. We live; we learn. And I've learned that my favorite, most "authentic" taco cart might be a travesty for someone from South of the Border. I certainly can't, with confidence, declare the complete authenticity of this Himalayan dish or that Icelandic one. But, if the Sichuan cuisine at Red House Chinese restaurant isn't brimming with authentic flavors, then I'm perfectly at peace with inauthenticity. At those taco carts, I always feel like I've made a good choice if there are mostly Latinos eating at them. At Red House, I've only seen two non-Asian customers during my visits, and I consider that an auspicious sign. Part of the reason might be that all of the restaurant's specials and much of the rest of the menu is written in Chinese. There is an English menu—without prices—but it seems aimed mostly at the sweet & sour crowd. Don't worry about the prices; they're ridiculously low. As for the menu, bring a Chinese friend with you, or prepare to work your way through recommendations by (mostly) non-English speaking servers. It's part of the fun. I didn't even know about the existence of Red House, which is located in State Street's Midtown Plaza, a mini United Nations of world cuisines that also includes Midtown Food Market, Tosh's Ramen, Korea House, Café Anh Hong and Mahider Ethiopian Restaurant & Market. Thankfully, a City Weekly reader named Brady recommended it to me. Red House is a clean, well-lit restaurant with sparse décor. I've seen only two college-age servers there during my visits, and there's usually catchy Chinese pop/dance music playing on the sound system. This is a good thing. The last time I ate there, I even heard an updated, Chinese pop version of "You Are My Sunshine." There's a sound system and flat-screen TV in front, and I'm told that karaoke is known to sometimes break out late at night. Anyway, you'll come for the food, not the ambience, pop tunes or karaoke. Start with a plate of a dozen made-from-scratch steamed dumplings ($6.99). They are perfectly cooked, fresh-made pasta purses stuffed with juicy minced pork, cabbage and Chinese chives. The signature steamed pao pork buns ($6.99) are also a Red House favorite. I normally like to begin a Chinese meal with hot & sour soup but was told by our friendly server that it was too big for two people. Instead, order one of Red House's more manageable soups ($7.99-$8.99) with handmade wheat noodles: spiced beef, pork belly, pork ribs and pig intestine are among the options. The truth is, every dish at Red House is too big for two people to handle. Generous portions—most which come with heaping helpings of white rice—are the norm, and prices tend to top out at around $10.99. Unless you come with a crowd, there will be leftovers—and I love leftovers. I really feel like I'm buying two meals each time I eat at Red House: dinner and then a lunch of leftovers for the following day. Still, I've yet to surpass the $30 mark for plentiful meals-for-two here. A classic Sichuan dish that you don't see on many local Chinese menus—none that I can think of—is Chongqing chicken ($7.99). Like much Sichuan cuisine, this dish is characterized by the bold flavors and heat of dried chili peppers. Bite-size pieces of boneless chicken are dunked into a simple marinade of cornstarch, egg whites and (usually) soy sauce and/or Chinese rice wine. Then, the chicken is rapidly deep-fried with a scary amount of those chili peppers and tossed with minced green onion. The result is incendiary chicken "poppers" with the lightest crunchy batter you could imagine. Aside from the heat, this is a dish that even youngsters can love. Often in restaurants, I leave thinking, "Well, I could've made that at home." But the fragrance, flavors and complexity of dishes such as cumin-spiced lamb ($9.99) and spicy pork ribs ($9.99) are another story altogether. The pork ribs, for example, are—typical of Sichuan cuisine—salty and garlicky, yet also fiery, and with a slightly sweet finish. 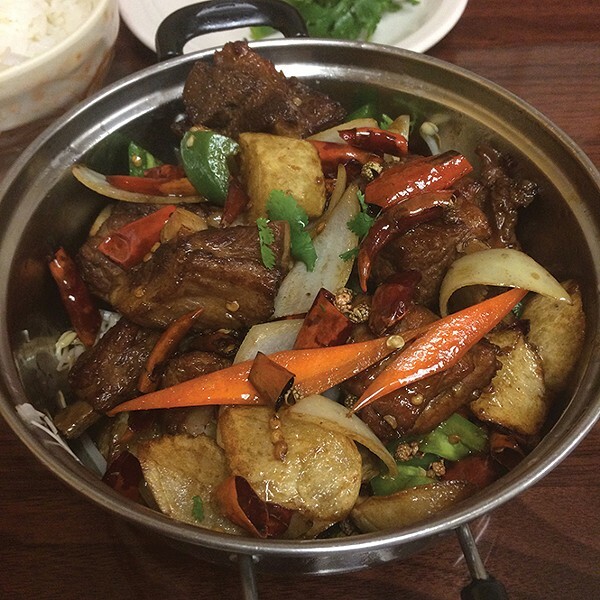 These are 1- to 2-inch bone-in pork-rib pieces cooked with a gorgeous crisp crust, wok-fried with onions, carrots, potatoes (something you don't find much in Chinese cooking) and loads of hot chilies. Offsetting the heat of the chilies is fragrant ginger and Sichuan peppercorns, the latter imparting a subtle lavender-like flavor. Pork is the most common protein found in Sichuan cooking, and this is Sichuan pork at its best. When I return to Red House with friends to help out with the mountains of food, I'll try its clay pot dishes such as mutton leg ($11.99), braised beef ($9.99) and hot & spicy fish ($9.99). For beef lovers, I have a couple of solid recommendations: First, there's beef with spring onions ($9.99). It's another dish that seems so simple on the surface, but it has deep, complex flavors, though not as spicy as many Red House dishes but still with some kick. The main attraction for me was the flavor and texture of thin-sliced, wok-fried beef, which was so tender I could have easily mistaken it for Wagyu. It comes in a garlic-ginger sauce with both regular onions and scallions. My favorite dish so far, though, is shredded, tender pork and soft, airy tofu tossed with peas, carrots and onion in a gorgeous, spicy sauce with anise and ginger notes ($10.99). The truth is, I thought long and hard before I decided to review Red House. It's a secret I'm not sure I want to share. But, that's what I do, so, enjoy! Now! Before the crowds come.